Proteins are the core components of all life processes and thus play central roles in biological mechanism and disease. Over billions of years a seemingly limited repertoire of protein types has evolved to produce an enormous diversity, with some 25 000 distinct proteins in humans and millions throughout nature. Understanding how their evolution is coupled to their function: how they interact with other molecules, form larger molecular machines, and ultimately create the vast complex networks inside of cells is critical for our deeper understanding of how living systems function, or malfunction pathologically. 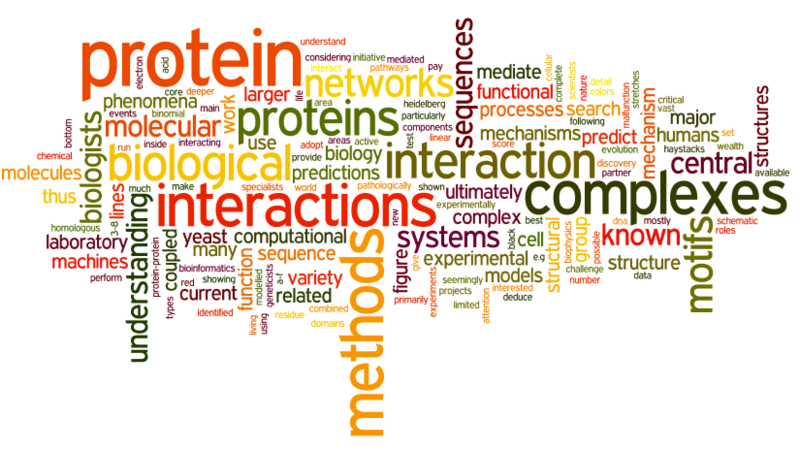 Our group is primarily interested in deciphering the mechanisms by which proteins recognise other molecules and ultimately to combine these mechanisms into models of molecular machines, pathways and larger biological systems. Central to this is our work on predictive networks, where we use biological networks to predict a variety of biological phenomena from phosphorylation events, to chemical toxicity in humans. We adopt a number of computational methods, coupled to laboratory experiments to deduce mechanism, and are very active in collaborations with other groups in the Heidelberg area, and the rest of the world. We develop and apply bioinformatics methods and numerous databases during the course of our work. We also run a small laboratory where we mostly perform biochemistry and biophysics approaches to test various predictions. Our collaborators include other computational scientists, molecular biologists, structural biologists, proteomics specialists, cell biologists, geneticists, chemists and many others. A full list of publications can be found here. Current projects are focused in the following main areas.